Quantum-dot switches made up of pairs of tiny puddles of forty to sixty paired electrons show promise as the building blocks for quantum computers. Each dot is only 200 nanometers wide. 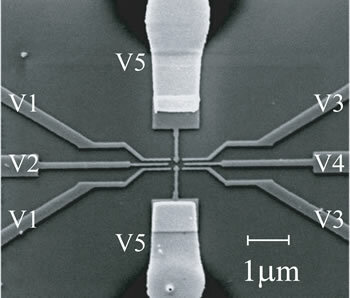 The two puddles are placed inside a semiconductor; each puddle is given a final, unpaired electron which gives the quantum dot a net spin of up or down. Finally, the two dot system is tuned so that the two unpaired electrons become "entangled" - that is, they begin to interact with each other. "Entanglement is a key property that would help give a quantum computer its power," says lead researcher Albert M. Chang, adjunct professor of physics in Purdue's School of Science. "Because each system exists in this mixed, down-up configuration, it may allow us to create switches that are both on and off at the same time. That's something current computer switches can't do." The hope for quantum computing is that, since a quantum computer's bits could be in two quantum states at once - both on and off - it might be possible to explore many different solutions simultaneously. "These computers would have massive parallelism built right in, allowing for the solution of many tough problems," Chang said. "But for us physicists, the possibilities of quantum computers extend beyond any single application. There also exists the potential to explore why there seem to be two kinds of reality in the universe – one of which, in everyday language, is said to stop when you cross the border 'into the interior of the atom.'" It is hoped that this method of producing qubits - quantum bits - will scale into large systems, a key advantage over previous methods. The speed at which Chang's qubit works is too slow for a marketable device; speed improvements are next. SF author Greg Bear writes about a quantum logic thinker in his 1990 novel Heads. See the news release Quantum computers are a quantum leap closer, say Purdue physicists.